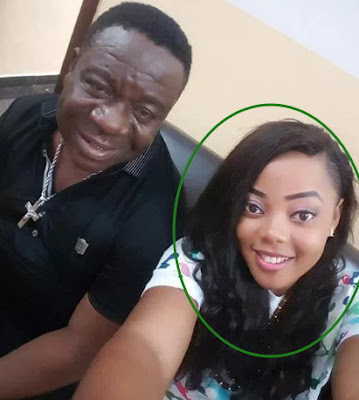 Budding Nigerian actress Sarah Ebhota has revealed a never before heard occurrence in the Nollywood movie industry. The fast rising in a recent chat with Pot Pourri revealed that over 80% of ladies in Nollywood use spiritual powers to get roles. 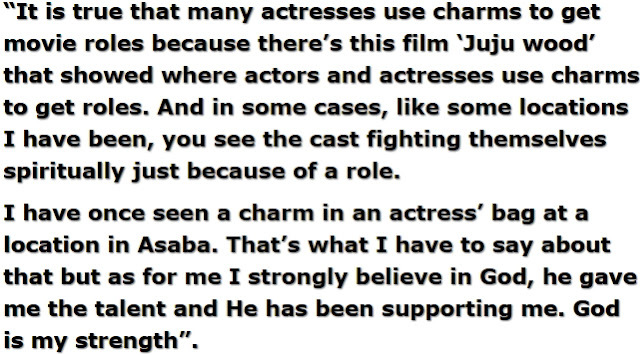 She also alleged that some cast members even go spiritual to fight rivals all in the name of getting roles. This explains why most Nollywood starts die untimely. Veteran Nollywood actress Iyabo Oko who is currently recovering in India after a spiritual attack alleged that the Nollywood movie industry is full of wicked people. WE HAVE GOOD ACTORS DEVOID OF EVIL DOING AND THE BAD ONES CAPABLE OF DOING ANYTHING TO HIT THE SPOTLIGHT .THERE IS PRINCIPALITIES AND POWERS..CHOOSE WHOM TO SERVE AND REAP THE CONSEQUENCES.CHRIST IS LORD.NO ONE EXCEPT THEE. But why in Nollywood industry alone . .or do they use charm in Hollywood also? Some use juju power,some use bottom power,some convert to gay….all the rotten powers are there to make them famous, all will fade away… but the supreme Power of God through Yeshua (JESUS) will always be the ultimate and authentic power, it will never fade or fail. No wonder they portray so much juju scenes in Nollywood films! May God help them, hmm! It is not Nollywood Actors alone the Musician too. These folks want to become millionaire for dropping a single album. If you are good in what you are doing the money will roll in later without stress. Trust me Juju only works for limited time and even hamper the good glory that God has already given some stars. this is eye opening so one cannot make it without juju? But Almighty God pass thdm!